Home Culture Do You Love Coca-Cola As Much As This Lady? Do You Love Coca-Cola As Much As This Lady? When people love something, it’s not uncommon for that love to be reflected in their homes. Some people have sports memorabilia, some have art, and some just really like a certain color. Then there’s Lillian and Barry, a couple from Glanmire, Ireland, who use their home to show off their love for something a bit different. Lillian began collecting Coca-Cola cans more than 30 years ago during her travels around Europe. She kept a Coke can from each country she visited as souvenirs, and her collection eventually grew to include cans from all over the world. When her friends and family went traveling, they were always sure to bring her back a can. Eventually, the Coca-Cola collection began including much more than cans. The small bedroom, where it all began. 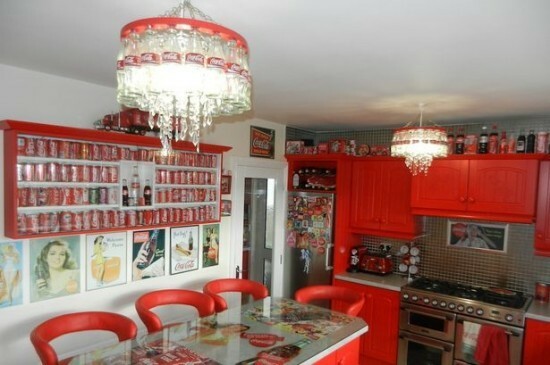 The idea to expand the Coke theme throughout the house came while watching Come Dine With Me, a reality show. 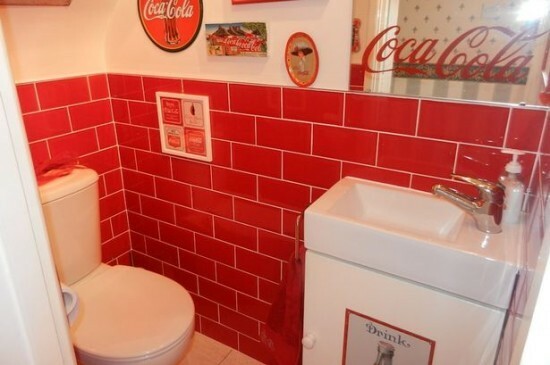 Lillian noticed that one of the contestants had a Coca-Cola sign in her kitchen, and took her inspiration from that. 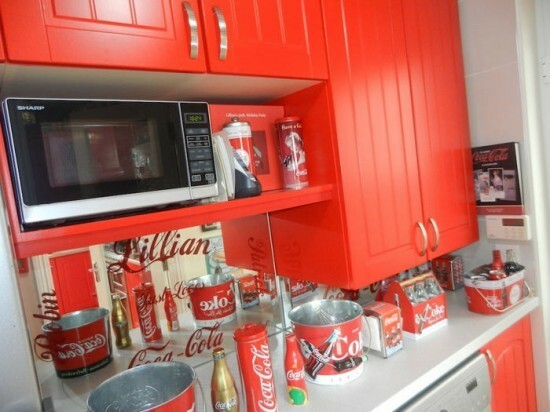 Lillian and her husband spent six months decorating their kitchen in a Coke theme. 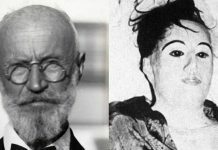 As for her husband, Barry, he seems to be on board with the idea. He even created two chandeliers out of old Coke bottles. 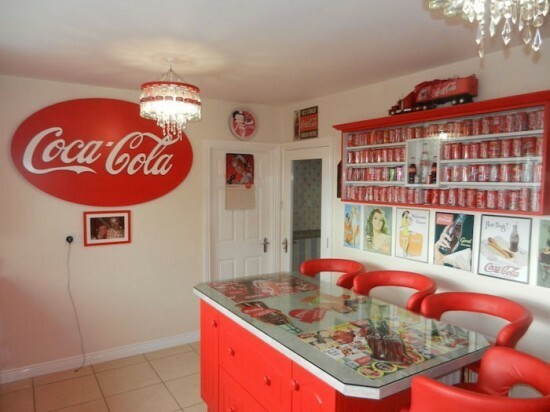 You can find Coca-Cola memorabilia from all over the world around the house, which is all done in bright red and white. 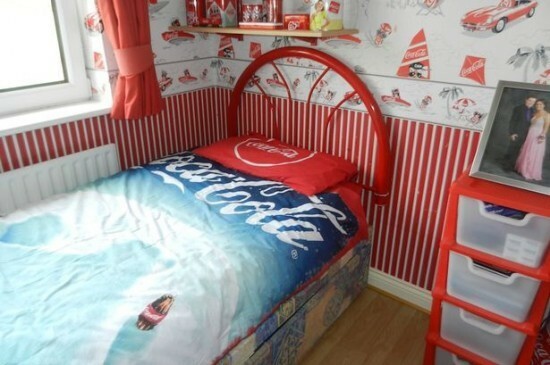 Today, every room in Lillian and Barry’s house has a Coca-Cola theme, and she’s still collecting. One of her favorite places to shop for memorabilia is all the way in New York City, in a Times Square shop called Grand Slam. She also shops closer to home. Yes, we do mean every room. Naturally, Lillian also has an opinion on the age old question: Coke or Pepsi? We’re pretty sure you know her answer. She dismisses Pepsi as “sweeter,” and too sweet for her liking. Lillian’s dedication to Coke is pretty serious. To date, she’s spent the equivalent of thousands of dollars on Coca-Cola items, and doesn’t plan to stop. Previous articleHow Grocery Stores Manipulate You – #8 Is A Real Eye Opener!